Fall II Rise is not new to the rock scene. They have however changed and evolved since their inception in 2009 in Puerto Rico. Combining members from another band and picking up their bass guitarist Tyler from Oklahoma, Betty (Guerrero) Rise believes they are now at full potential. She says that the new EP will be more representative of who they are now as a band, varying significantly from the previous self-titled CD “Fall II Rise” released in 2012. 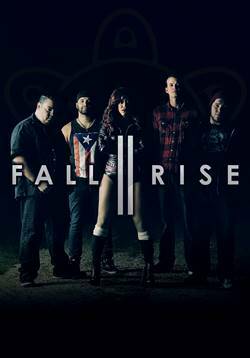 Having achieved national popularity in their native territory of Puerto Rico, Fall II Rise went on to tour in the United States. The response in the Midwest was so positive that they decided to relocate to Madison, WI where they have been since April 2014. I asked Betty about the origin of the band name. She indicated that at the time they named the band, there was no real story behind it. Rather, the band has grown into the name as they have created their own story of struggling and getting back up again. “The story kind of developed itself as the band grew, the way the band has developed itself and all of the things that we’ve gone through and all of the struggles. You have to fall a lot of times in order to rise and actually accomplish what you really want,” Betty said. I was also curious about the singer’s stage name “Betty Rise.” It was pretty evident that the last name was tied to the band name. It also makes things much simpler, as her real name has a lot of rolling “R’s” and she felt that she kept over explaining it. Thus the name Betty Rise was born and seems fitting for her role as lead singer. I asked Betty and Tyler if they have a timeline for releasing even more new songs. They said they are always working and writing music. They estimated that by next summer they would probably have new music to release. As a band they are really committed to writing their own music and not doing cover songs.